Dr. Mallove was a graduate of MIT and Harvard; a leading scientist, engineer and writer. and the founder and President of the New Energy Foundation. He is the author of three science books, including Fire From Ice: Searching for the Truth Behind The Cold Fusion Furor (John Wiley & Sons, 1991), which was nominated for a Pulitzer. He has taught science journalism at MIT and at Boston University, was Chief Science Writer at MIT News office, and a top science writer and broadcaster with the Voice of America in Washington DC. Dr. Mallove also wrote science and technology articles for magazines and newspapers, including MIT Technology Review and The Washington Post. Eugene Mallove was the Technical Advisor to the 1997 Paramount Pictures techno-thriller, The Saint, starring Val Kilmer and Elisabeth Shue. 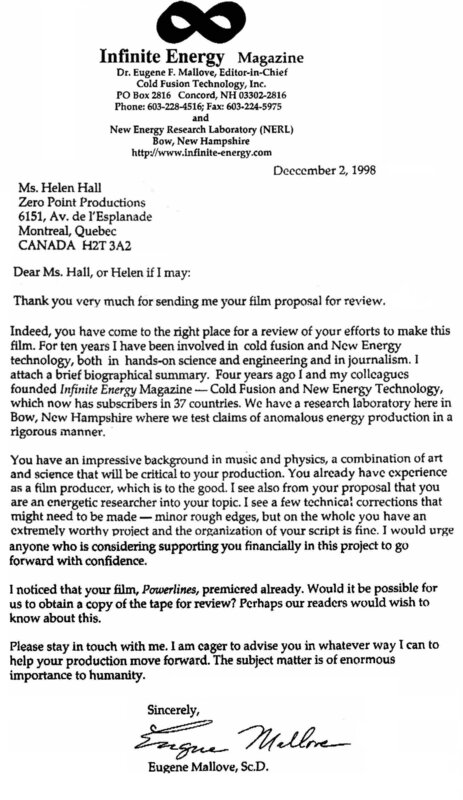 The central theme of the film is cold fusion.